21 & Finally Legal - Birthday Sash - Birthday Party - Satin Sash Elegant satin sash for the Birthday Girl who won't settle for anything less than exquisite! These handmade sashes make a perfect gift that she can hold onto and cherish for years to come. Each of our sashes are handmade in our Houston studio. 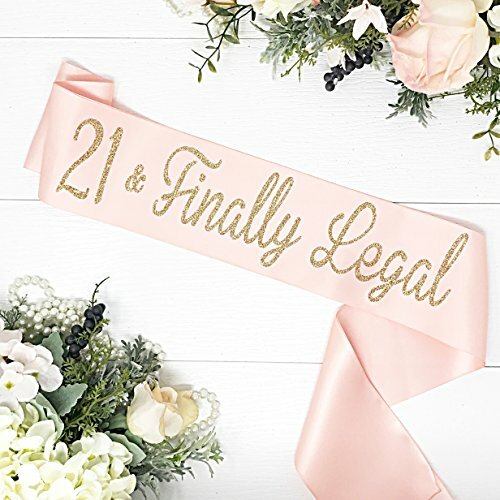 Stunning double faced sunset blush satin make a gorgeous sash with gold "21 & Finally Legal" in a script font. Wording it professionally heat pressed assured to last for years to come. These sashes are made extra long measuring at 72" and clasp together with a pin to keep the sash in place. Packaged in a delicate organza bag, ready to gift.